The trouble with companies is that they're full of people, and people insist on having separate personalities and distinct voices. So, it's no wonder that issues of consistency and tone of voice creep into our conversations when we take an honest look at our content. 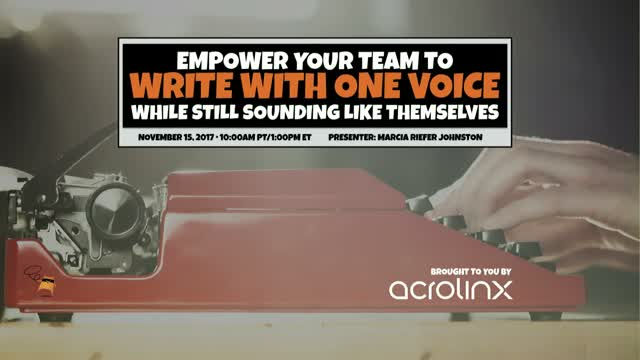 Join guest host, Val Swisher, sitting in for Scott Abel, The Content Wrangler, and her special guest, wordsmith extraordinaire, Marcia Riefer Johnston for a free one-hour webinar during which we'll discuss the role voice plays in unifying a company's content strategy. You'll learn how to build a brand voice without sacrificing the individuality of the content creators on your team. And, you'll discover ways to empower content creators to succeed by participating in a simple, fun exercise.